Tell the time from the observed positions of the Sun or stars. 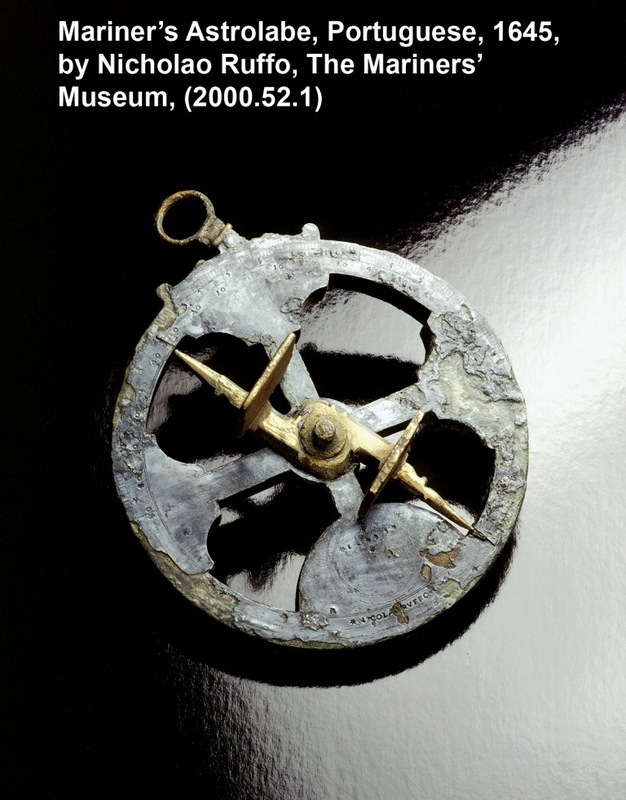 In addition, astrolabes were frequently used to cast horoscopes. A planispheric astrolabe is based on a two dimensional map of the sky, rendered in most cases by stereographic projection. Such a projection can be imagined as the view of the sky that would be seen by an observer standing on the south pole and looking straight “down”, through the solid earth, at the northern sky. The observer would thus see a circular sky, centered on the north celestial pole. Normally, astrolabes take the projection of the Tropic of Capricorn (the line of latitudes at 23.5 degrees south) as the edge of the circular map. Other key latitudes – the Equator and the Tropic of Cancer – would project onto this view as smaller concentric circles. A real observer, of course, has no x-ray vision and only sees part of the sky at any one time – and part that he does see varies with his latitude and the time of the day. The markers of the astrolabe solved this problem by fitting each astrolabe with a series of removable plates (Arabic: safiha), each showing a polar grid and horizon for a small range of latitudes. By rotating the star map above these plates, one can simulate the rising and setting of stars against the fixed horizon and thus the sky view at a particular latitude. This “rete” (Arabic: ankubat) was typically fashioned as a beautiful frame that carried star names without obscuring the underlying grid lines. 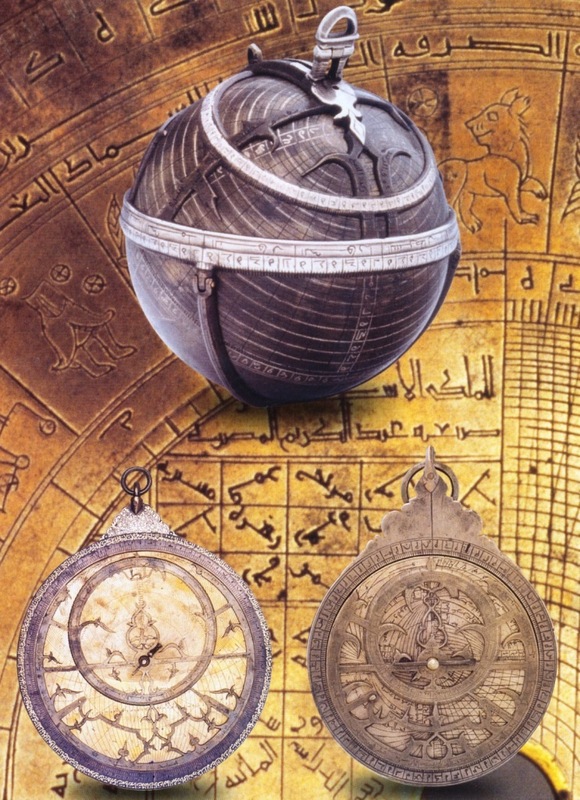 The astrolabe was not primarily an observational instrument, although on its reverse side it was equipped with an alidade, or sighting rule (Arabic: alidada), along which a star’s altitude or bearing could be determined. Some astrolabes were modified for use at sea; they were made heavier or pe rforated so as to reduce the chance that instrument would be blown by strong winds on the deck of a ship. 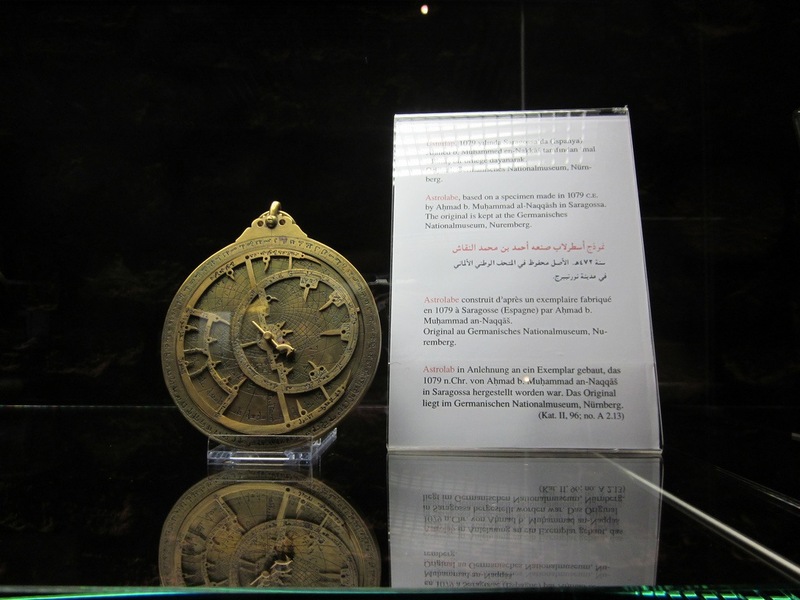 The astrolabe was probably perfected by Arab astronomers, such as Muhammed Musa al Khwarizmi in the early 9th century, building on Greek understanding. The earliest surviving examples, however, date from the late 10th century. The astrolabe fell out of use in the 17th century in the West and somewhat later in the East, succumbing to more accurate observational tools and printed astronomical almanacs. 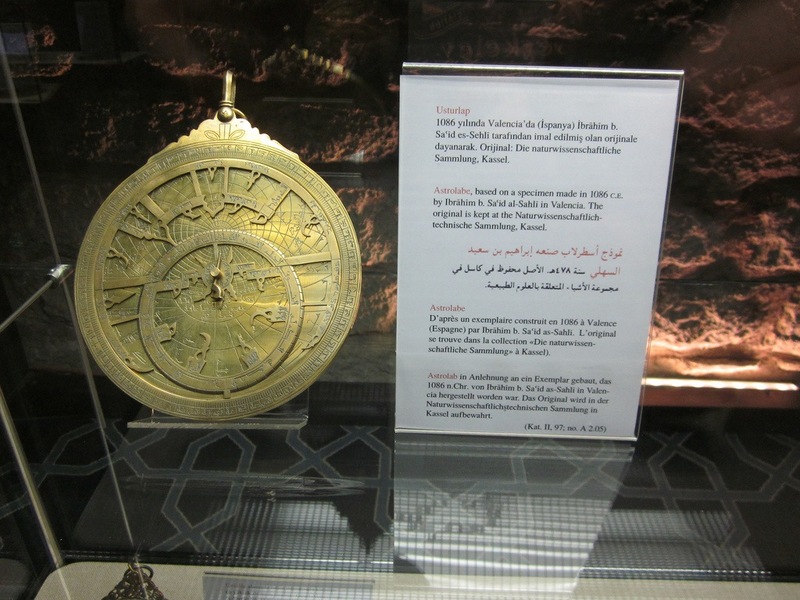 Astrolabes are still made today in Afghanistan and India for tourist market; they can even be found in Oman in Muttrah souq. But these are often crude imitations of the real thing, which was not simply an accurate scientific instrument but an object of great beauty. 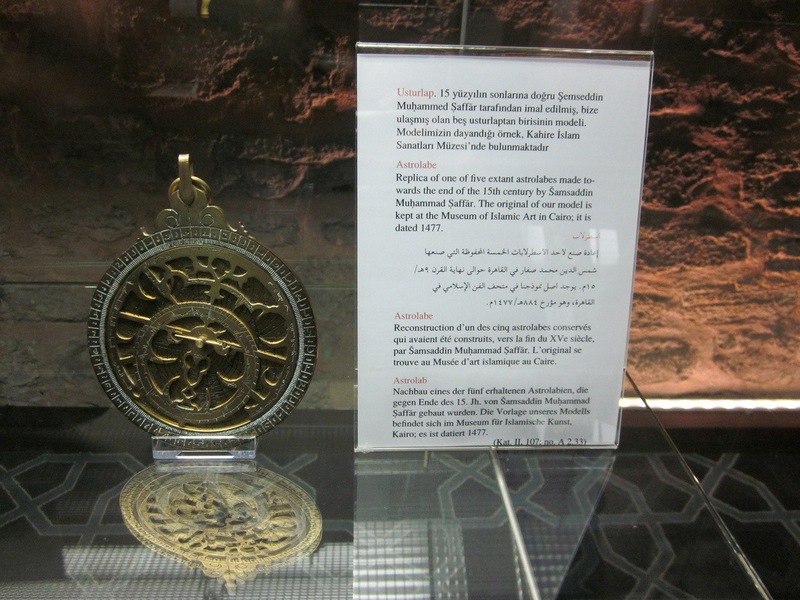 Perhaps the most beautiful surviving astrolabe is the spherical one signed “work of Musa year 885” (i.e. 1480-1 CE) pictured above. They are different types of astrolabes. The spherical astrolabe (top) is generally acknowledged as the most beautiful of its kind. It dates back to 1480 CE. Conventional astrolabes (bottom left and right on above picture) were flat and consists of rotatable frames and removable, engraved plates. Yeah! The most amazing feature in iPhone 4 is the Gyroscope built-in. Which makes the iPhone 4 Astronomy edition. I’m including iPhone 4 as one of my AstrO Gears product. Why! Just see below… I will include more features of this gear later on. The next surprise is that iPhone 4 this Month will be taken aboard the International Space Station via STS-135 to help conduct ground breaking experiments. Odyssey Space Research LLC, of Houston, TX, has developed an iOS application that will take advantage of the iPhones built-in mechanisms. Four experiments are planned, click on the image above to read more. What are you waiting for! Download the application now. Need an iPhone! It’s available in AstrOceanOmy Store. SkyScout is a revolutionary handheld device that uses advanced GPS technology with point and click convenience to instantly identify over 50,000 stars, planets, constellations and more. Identify: Simply point the SkyScout at any star in the sky and click the “target” button. The SkyScout will instantly tell you what object you are looking at. Locate: To locate a star or planet, select the objects name from the menu and follow the directional arrows through the viewfinder. SkyScout tells you when you are on target. It’s that easy! In addition, the SkyScout also features a ‘Tonight’s Highlights’ function which provides you with a customized list of the 20 best objects you can view for your exact date, time and location anywhere in the world. Learn: Once you have targeted an object the real fun begins. The SkyScout includes entertaining and educational audio and text information, including facts, trivia, history and mythology about our most popular celestial objects. If you locate a star that is part of a constellation, the SkyScout will even talk you through every star within that constellation along with providing a detailed onscreen map on the whole constellation. A fun learning tool for all ages, the SkyScout personal planetarium puts the knowledge of an expert astronomer in the palm of your hand. Click here for more from Celestron website. Not to forget that the Celestron SkyScout Personal Planetarium is the “Official Product” of the International Year of Astronomy (IYA) 2009! I already purchased mine since long time back and would like to share some pictures:. While opening the box, I’ve noticed something strange and funny in the package 🙂 . I’ll come up with more details in the next post. Please visit for updates. SkyScout is available for purchase in AstrOceanOmy Store . Anyone in Oman who would like to purchase, please contact me.